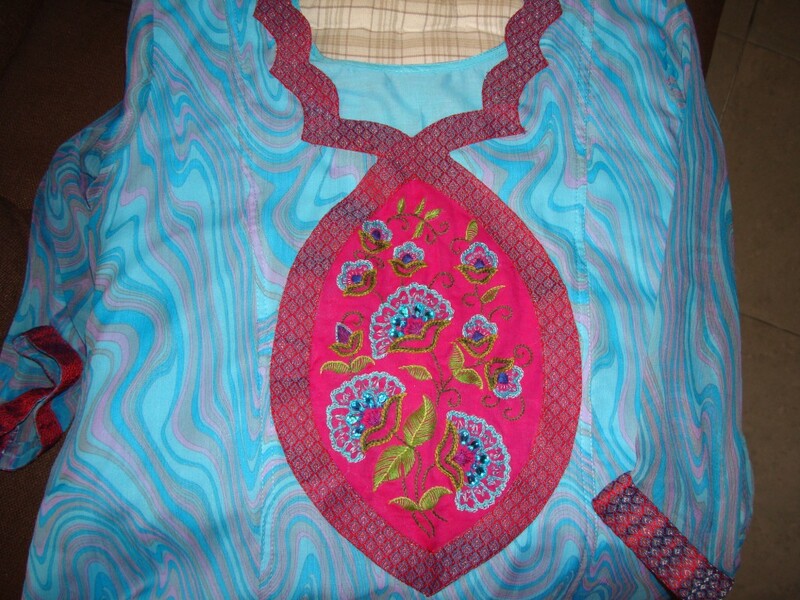 This is tunic is from the old set, which I have worn for some time now. This embroidery was done in 2005. The tunic fabric is printed voile, which is ideal wear for summer. It started as a pant top and ended as a salwar[ Indian pants] top. 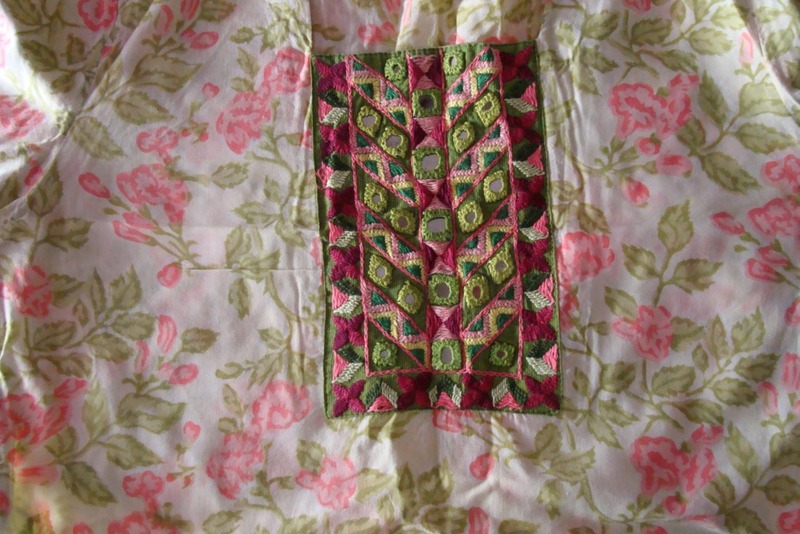 The tunic is light green , with green and pink floral print. 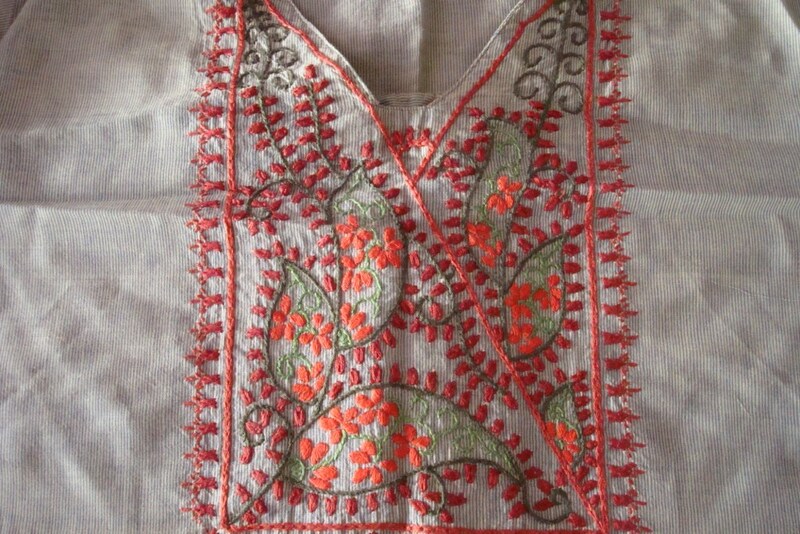 The yoke fabric is mangalagiri cotton in parrot green. 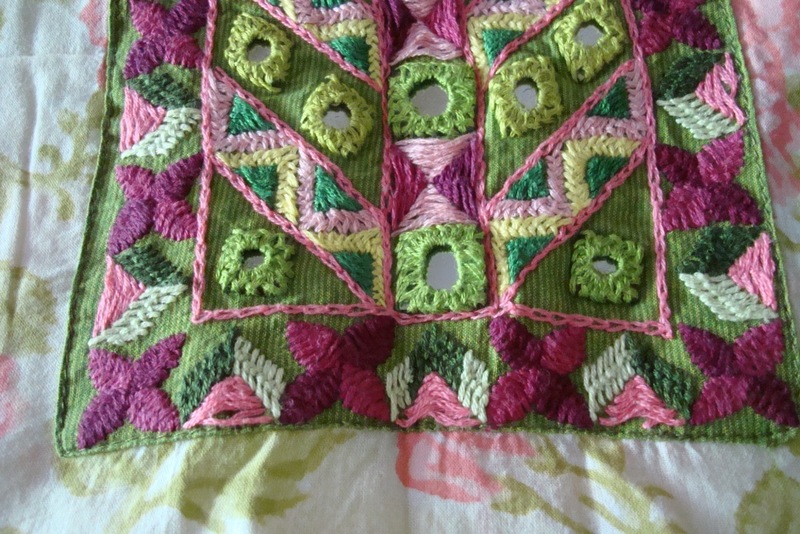 The embroidery idea was to work some geometrical patterns in herringbone stitch around the mirrors. 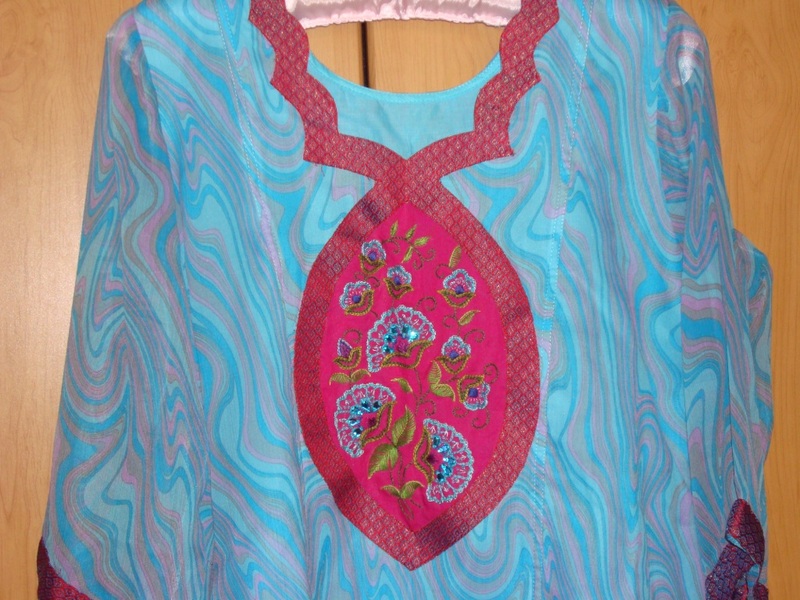 The pattern was drawn on graph and then traced on to the yoke fabric. The mirrors were worked in the same green colour. The other colours were, shades of pink and green , lemon yellow. The fabric is so comfortable to wear, being in favourite colours of many , generally most people like this. It is better to have certain sure colour combinations in mind, before working on any project, because embroidery being an embellishment and value addition to any fabric, encouragement comes from others positive comments. 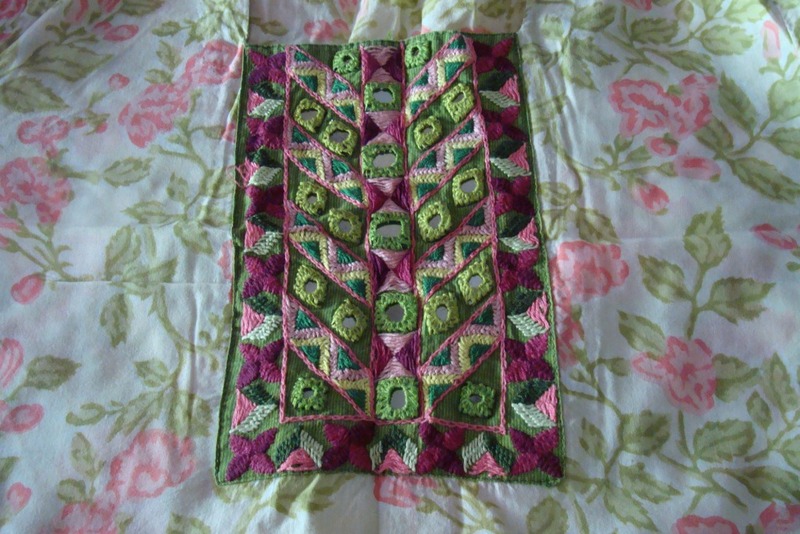 The kutch work tutorial is posted here. some pictures are hiding I don’t know why! I am still working on this tutorial. Never realised it’ll be so tedious.But Iam enjoying it. 3. Important- the thread path- the thread always goes up and down alternatively, this keeps the embroidery intact.looks attractive also. 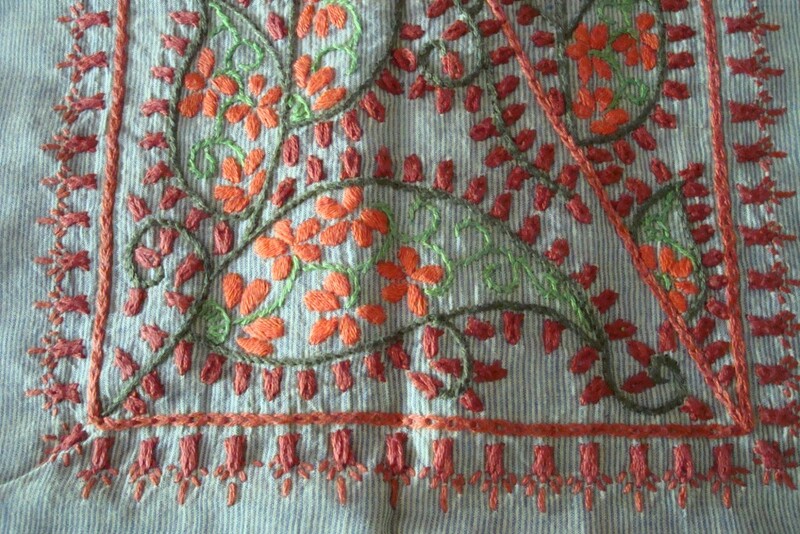 If there are mistakes, it is visible to the eye, and the finished embroidery does not look good. Thought I ‘ll post these points while I write the tutorials too. Whenever someone asked for a kutchwork tutorial, I was putting it off for a future date. I ‘ll also start from the basics,but I feel Bhavani has done a woderful job. So if you have some doubts , you can check and compare with Bhavani’s tutorial. Deepa has also done a tutorial on this with a variation, how to do kutchwork over a shisha[mirror]? I haven’t tried her version of working this stitch. As far as I know , there are three methods of working this stitch. 1.In this type , the edges are blunt or curved- this is the most popular variety.Bhavani has given tutorial for this type. 2. In this type, the edges are pointed- the final effect looks different. I learn’t this type and later progressed to do both types. 3. In this type, the squares are filled like weave. All kutch work patterns can be worked in type1 or type 2 methods. type 3 being a filling method can be used only for appropriate patterns. From my next post , I ‘ll start with the most basic square and move on to small motifs, border,and finish with the working of the geometrical motifs posted on my blog. 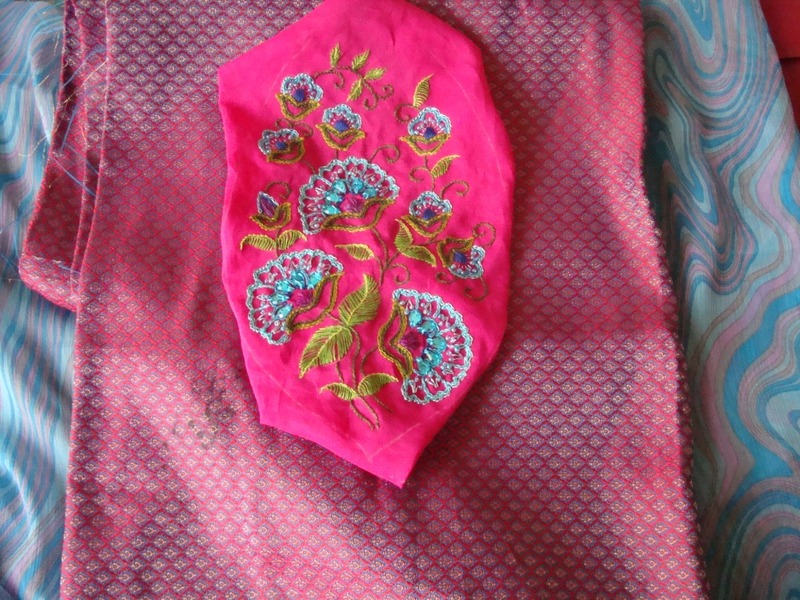 Posting the progress on my embroidery on this pink tunic has made this tunic story very long. What I hadn’t anticipated was for the tailor to be so inspired by the brocade material, that he played with the design of the tunic .wait for my next post.